I bucked up and pushed a while longer, but the next 30 miles were a complete pity party. I had fallen into the trap that ensnares so many late in an ultramarathon. That little voice that says, “It’s okay to take a walk break — you’re hurting.” Or, “Your training wasn’t perfect, you can slow down.” A negative thought pattern emerges and you give it wings by listening to it, sighing, or voicing your opinion to someone else. I continued down the negative self-talk spiral, plummeting my motivation and my pace, and I was full of excuses. I needed to take a walk break. I had to adjust my pack. My shoe needed re-lacing. Soon I was jeopardizing breaking 16 hours instead of my original goal of sub-15. At mile 85, I finally came to this realization and told myself that it was unacceptable. I became my own drill sergeant and forbade myself hike breaks. I promptly began doing 15-second pick-ups every few minutes to get into a different pace zone. My pace began to increase, and I was clipping off a minute per mile faster than I had been over the previous 30. It took a simple shift of my internal monologue. A study conducted by Brock University in St. Catharines, Ontario tested 18 cyclists who had been instructed in a Motivational Self-Talk (MST) method. The study measured the effectiveness of a two-week MST intervention (specific to heat tolerance) on endurance capacity and cognitive function in the heat. By simply using positive self-talk, the cyclists’ endurance went from 8 minutes to 11 minutes, and it allowed them to push their core temperatures a half-degree higher. Their positive internal dialogue literally allowed the athletes to physically dig deeper. This and other emerging self-talk research studies highlighted in Alex Hutchinson’s book, Endure, shows that athletes have the capability to influence how the brain interprets the body’s signals. These signals determine just how far your body is able to push. As an ultra running endurance coach, I have frequent discussions with my athletes about keeping internal speak positive — even when you’re suffering. Giving voice to discomfort and pain only makes it worse. And it’s a slippery slope. Simple things like sighing are mental cues that send signals to the body. Fake it till you make it. Even when you’re hurting, don’t give negative thoughts any footing. If an aid station volunteer asks me how I’m doing, I smile and say I’m awesome. I might try to joke with them and make light of my situation. Especially if I’m feeling bad. Laugh and whoop it up. This goes hand in hand with the above method. Look around, take it in, and get jazzed about your surroundings. Run Rabbit Run 100 course record holder and ultra-fast guy, Jason Schlarb, said he laughs out loud when he’s hurting. The simple act of smiling — moving the muscles in your face — triggers neurotransmitters to release endorphins. Smiling and laughing release these feel-good chemicals and lower the stress hormone, cortisol. Be in the moment. I like to fully engage in the upcoming sections of trail and concentrate on leveraging every step. Power hike for 7 breaths, and run for 11. This technique, if used for a while, becomes meditative. You’ll find a flow state that allows complete immersion in the moment. Staying motivated and in a positive mental state during long trail races takes practice. You really have to practice it in your everyday life. If you’re not intentional on a regular basis, you’re going to struggle to hold it together when the going gets tough in a longer effort. We have an average of 60,000 thoughts per day. Most people believe we have zero control over these thoughts, but that’s just not true. You can choose whether you’re going to get mad at that person who just cut you off on your way to the bank. I like to be intentional about those situations; it’s the opportunity for perfect mental practice. If someone cuts me off, I give them the benefit of the doubt. Perhaps they are in a hurry because they have a sick kid at home. Creating scenarios that spin a potential negative situation to a positive one takes practice. If you’re constantly looking for the good in every situation you encounter, you’ll probably find it. Of course, the same is true on the flip side. Look for the bad, and you’ll surely find it. Not only will your day go more smoothly when you’re looking on the bright side, but you’ll be happier in general. 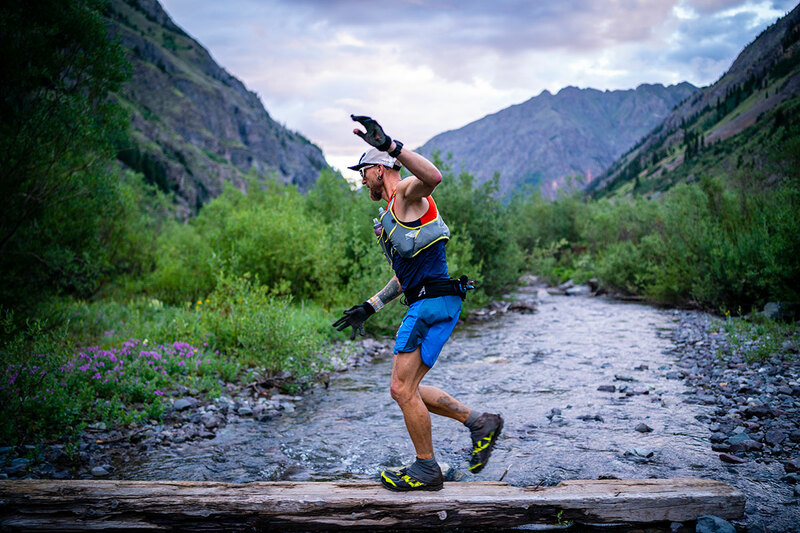 Plus, you’ll be honing your mental prowess for your next ultra trail race. Giddyup!